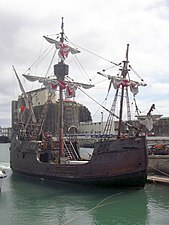 ^ a b "ShipWiki - Santa Maria". Shipwiki.wikispaces.com. Retrieved 2014-07-15. 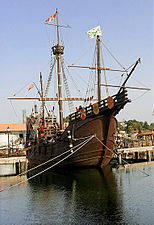 ^ "Christopher Columbus Ships". Elizabethan-era.org.uk. 2012-05-16. Retrieved 2014-07-15. 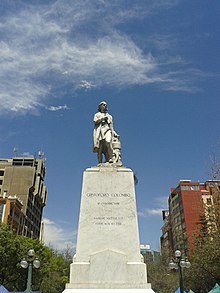 ^ Columbus, Christopher (1893). "The Journal of Christopher Columbus (During His First Voyage, 1492-93) and Documents Relating to the Voyages of John Cabot and Gaspar Corte Real". Internet Archive. Trans. Clement R. Markham. London: Hakluyt Society. Retrieved 1 Dec 2014. ^ Maclean, Frances (January 2008). "The Lost Fort of Columbus". Smithsonian Magazine. Retrieved January 24, 2008. ^ "Article du Florida Museum of Natural History". Flmnh.ufl.edu. Retrieved 2014-07-15. ^ David Keys (May 13, 2014). "Exclusive: Found after 500 years, the wreck of Christopher Columbus's flagship the Santa Maria". The Independent. Retrieved May 13, 2014. ^ Laura Smith-Spark (October 7, 2014). 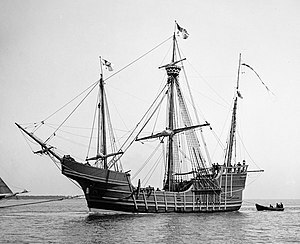 "Haiti wreck isn't Columbus' ship Santa Maria, U.N. says - CNN.com". CNN.com. CNN. Retrieved 29 September 2015. ^ "QUEER CRAFT THESE CARAVELS. - Those Who Saw Them Hobble to Anchor Marveled at Columbus's Pluck". New York Times. 26 April 1893. Retrieved 18 November 2015. (Subscription required (help)). ^ West Edmonton Mall. "WEM Santa Maria page". Wem.ca. Retrieved 2014-07-15. ^ Albrecht, Eric. 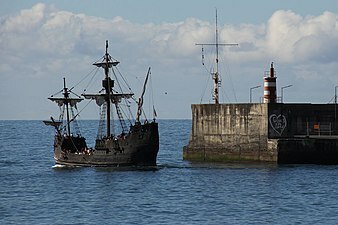 "Setting Sail for Parts Unknown: Santa Maria!". photographcolumbus.wordpress.com. Retrieved August 11, 2015. ^ "Santa María de Columbo". Santamariadecolombo.com. Retrieved 2014-07-15.